I actually have to start this post with an apology, to not only RadioSEGA, but also to everyone behind this awesome project. I was told about ‘Collision Theory’ about a week or so ago and was due to write this post up before its release date (which was on September 1st) but unfortunately ‘life happened’ and it slipped to the side lines. So apologies to everyone there – but here we go! Our great friends over at RadioSEGA have been working with the SEGA music scene to create an awesome compilation album of SEGA mash-ups, called Collision Theory. The great thing about the album is that the musicians have brought together music from games you just wouldn’t think to. Such as taking Ristar and mixing it with Streets of Rage 2, or NiGHTS into Dreams with Panzer Dragoon – and it works! Plus, for the first two months of its release, you can ‘name your price’ when you purchase the album! Interested? 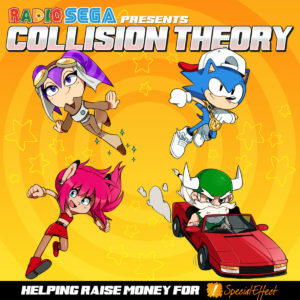 You can buy Collision Theory from RadioSEGA’s bandcamp page, where you can also listen to tracks from the album. It’s a really great idea and always awesome to see the SEGA music community coming together for such a good cause.